AVE YOU EVER watched a balloon as it slowly meandered upward into the sky? The balloon is able to fly because the air within it is lighter than the surrounding airjust set it free and its off. Many people think quite differently about airplanes, however. Knowing that these machines are clearly heavier than air, they might wonder what exactly keeps an airplane in the sky. And they might fear that any airplane might just fall out of the sky. In fact, to some people, airplanes seem more at peace sitting on the ground than they do in the air. 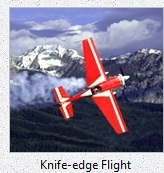 If so, this page will help you understand some basic principles of aircraft flight. Youll learn that many fears are unfounded, and that some feared events not only are improbable but also are not as dangerous as might be believed. An airplane generates lift, however, only when it is moving. This is completely different than a lighter-than-air balloon. Its also common sense, because we all know that parked airplaneseven taxiing airplanesare not flying. An airplane flies only when it builds up enough speed in the take-off run. At take-off, the wings have sufficient airspeed to push down hard enough on the air to overcome the airplanes weight. Its a common mistake to confuse an airplanes ability to fly with the need for an engine to push or pull it through the air. Consider that gliders can stay aloft for hours riding rising air currents, but if a glider is towed aloft and finds the air not good for sailing, it turns around and glides back down to the airport. The principle here is this: Altitude can always be traded in for airspeed. The same thing is true for regular airplanes. Even with all the engines stopped an airplane can glide back down. Of course, it wont glide as well as a sailplane, and it cant climb in an updraft, but it wont fall like a rock either. Its altitude will be traded for airspeed, and the airspeed will generate enough lift to fly it back down to the ground for a safe landing. You can also rest assured that pilots are specifically trained to fly an airplane with any number of enginesincluding all of themnot working. (And on jets, if an engine catches fire, built-in fire extinguishers will put out the fire.) Getting back to the ground after an emergency might be scary, but you will likely survive. Many persons become frightened when an airplane makes a steep turn. Usually, passenger aircraft keep their turns shallow for just this reason, but sometimes, especially on take off, noise abatement regulations require a sharp turn to avoid noise-sensitive areas on the ground. In this regard, its important to know that an airplane does not turn with its rudder, like a boat in the water; it must bank its wings to turn. Aerodynamically, the wings must generate some extra lift to pull the plane around in the turn; this extra lift generates a considerable centrifugal force. Pilots often describe this as pulling +Gz. This force is measured in units of gravity, so a moderately steep 2G turn draws as much force as twice the pull of gravity. So you, as a passenger within the turning airplane, will feel pulled down into your seat as a result. This is not a sign that the airplane is about to tip over, as some people fear. An airplane can bank as much as it wants. The airplane can actually fly quite well when it is upside down (although any cabin items and passengers that are not securely fastened down will have problems). In fact, aerobatic pilotsand I, a private pilot myself, have flown aerobatics just for funtake great delight in flying upside down (inverted flight), on edge (knife-edge flight), and going all the way around (a roll). Just after take-off the landing gear will be retracted, causing a thumping sound. You might hear the engines throttle back when leveling off for cruise. You might hear whirring sounds as flaps and spoilers are extended for descent and landing. Finally, before landing, you will hear thumping as the landing gear comes down. Surprising as it is to most people, an airplane moves through air that is itself moving. Moving air flows in ways that are quite similar to moving water, only we cannot see the air currents like we can see the swirls and ripples of water. Air currents vary, and flying rapidly from one current to another is what leads to the feeling of turbulence. Some people call this hitting an air pocket, but this description is a misnomer. The jolt comes not from falling into a hole in the air but from crossing a barrier between different currents. Convective currents result from the sun heating the ground, causing air to rise. As the air rises, it cools and forms cloudsthose pretty, white, fluffy cumulus clouds that look so nice and soft on the outside and are boiling with activity inside. Hence pilots are always looking for smooth air above the clouds where the convection stops. Obstructions to wind flow cause all kinds of eddies and currents. On a city street you may have seen papers blowing around in circles between buildings; in an airplane you will notice this kind of turbulence when flying over mountains; e.g., especially on the eastern side of the Rockies in the US and over the Alps in Europe. Wind shear occurs at the boundary between winds that differ in speed or direction, or both. Common near temperature inversions and at the border between weather fronts, this kind of turbulence is most likely encountered in a large aircraft at high altitudes near the jet stream. Although turbulence is generally not dangerous, it would be a lie to say that it is never dangerous. So lets sort out the dangerous aspects of it. When an aircraft flies through turbulent air, though, it will tend to rock its wings and dip and bob, all because the air in which it is flying is moving erratically. There is nothing dangerous about this because there is no physical law that says an airplane has to fly in a straight line at a constant altitude. For example, if you watch an aerobatic airshow you will realize that airplanes can fly in all sorts of positionsupside down, straight up, straight down, sideways, and, for a short time, even backwardsand still be perfectly safe. So, even though level flight may be preferred, if an airplane enters turbulent air, its erratic flight poses no real safety issue to the airplane itself. Usually. According to FAA regulations, all aircraft are designed and built to withstand far more stress than occurs in normal flight, including ordinary turbulence. But the turbulent air in severe thunderstorms can be so powerful that it can literally rip a small airplane to pieces. Now, Im talking here about the danger of flying right into the middle of the biggest and meanest thunderclouds there are. No competent pilot would ever do that deliberately. It is true that small, general aviation airplanes have often gotten destroyed in thunderstorms, all because the pilot was flying in the clouds and, not having on-board radar to distinguish a thunderstorm from the surrounding clouds, inadvertently flew right into a big thundercloud. But commercial aviation has a far better history than general aviation. Dispatchers who plan the flights will route flights away from thunderstorms. Sometimes they will even cancel flights because of thunderstorms. Pilots of commercial aircraft also have on-board radar to spot and avoid thunderstorms, and they will often request a course change to avoid bad weather. So, if your flight is delayed or cancelled because of weather, be grateful, not angry. When an airplane flies into downward-moving air, the airplane will drop with the air. But anything not securely attached to the airplane itselfsuch as food service items and passengers who are not strapped to their seatscan get thrown around the cabin. You should be aware that turbulence can be forecast by aviation weather services, so pilots are likely to be aware of it in advance and will try to avoid it. This explains why the Fasten Seat Belts sign comes on well before the bumps start. Occasionally, though, turbulence (such as clear air turbulence which doesnt have any clouds around it to give a visual warning) can be unexpected. Many passengers who get injured because of turbulence are those who, unlike more experienced travelers, do not keep their seat belts loosely fastened at all times. To be safe, you might want to remember that any time you unfasten your seat belt, whether to feel more comfortable or to get up from your seatregardless of whether or not the seat belt sign is offyoure risking injury from sudden turbulence. Although injury from turbulence is rare, if you keep in mind that walking around an airplane cabin is not as simple and safe as walking around your living room, you can help to keep yourself safe. Altitude Loss Near the Ground. Sudden altitude changes can also be a consequence of flying in turbulent air. When you are thousands of feet above the ground, a few hundred feet of altitude loss doesnt count for much. But if the airplane is only a few hundred feet above the ground, as when it is in the process of taking off or landing, then a few hundred feet of altitude loss can make all the difference in the world. Wake turbulence occurs when an aircraft leaves a trail of disturbed air behind it simply as a result of its flying through the air. This turbulence is greatest when it is flying slowly during take-off or landing. The turbulence poses no danger to the aircraft itself, but any other aircraft following too closely behind it can fly into the turbulent air and lose control. For this reason, air traffic controllers maintain strict limits of spacing between aircraft, both on arrival and departure. This concern for safety can cause traffic delays, but they are well worth the safety advantage. Thunderstorms, as I mentioned above, can cause big problems for airplanes flying near them, especially because the storms can produce strong, unexpected downdrafts. And there have been planes that crashed while landing all because the plane dropped onto the ground before it could recover from a sudden downdraft. Thankfully, these accidents of the past have only made pilots more aware of the problem of sudden wind shifts during take-off and landing. In addition, many airports now have special detectors to warn pilots of unusual wind behavior in the vicinity of the airport. Wind Changes Near the Ground. Turbulent air aloft is not a problem in regard to an aircrafts airspeed, because no matter how fast the wind is blowing, and no matter whether the aircraft is flying with or against the wind, all that matters aerodynamically is that the aircraft be moving sufficiently fast relative to the air around it to generate the lift necessary to keep flying. For example, if an aircrafts airspeed is 300 knots that means it is moving through the air mass around it at 300 knots. If that same mass of air is also moving (relative to the ground) at 300 knots opposite to the direction the aircraft is flying, the aircrafts airspeed is still 300 knots. Even though we might think that the aircraft is flying against the wind, it is really flying quite safely within a moving air mass. In the above example, although the aircraft has an airspeed of 300 knots, its groundspeed is 0 knots. Technically, it is hovering over the ground because the air is moving it backwards (relative to the ground) at the same rate as the aircraft is flying forwards (relative to the ground). Of course, my example of wind blowing at 300 knots is highly exaggerated, even in the jet stream, and I use the example just to make the point about groundspeed easier to comprehend. More realistically, though, if you watch gliding birds such as hawks and seagulls, you can occasionally see them hover over one spot on the ground just by pointing themselves into the wind and matching their airspeed with the speed of the wind. OK. So understanding this much about airspeed and groundspeed, you can now grasp the safety problem in regard to wind changes when the aircraft is near the ground. If the aircraft is just about to land and suddenly the wind changes to a tail wind, the plane can actually get blown right off the end of the runway. In fact, several aircraft accidents have happened like this. In trying to land in the vicinity of a thunderstorm, pilots under pressure to land, rather than divert to another airport, have been surprised by strong, erratic winds and, on touchdown, have landed too far down the runway, lost control, and slid right off the runway. Please note that sudden, unpredictable wind changes near the ground usually happen because of a thunderstorm in the vicinity of the airport. Wind changes can happen because of a larger weather system such as a front, but such wind changes are usually a matter of changes in wind speed, not radical changes in wind direction. Therefore, strong winds in themselves do not usually cause problems for commercial aviation. If flights are cancelled because of strong winds, its usually for a very special reason. Large airports have multiple runways in use at the same time, under the direction of Air Traffic Control, and, quite often, various runways are oriented in different directions. If winds are especially strong, the airport may, for safety reasons, close its crosswind runwaysthat is, the runways the wind is blowing across, rather than more-or-less straight downbecause (a) it can be difficult for an airplane to accelerate or decelerate straight down a runway when a very strong wind is blowing it sideways, and (b) takeoff and landing distances are increased whenever the airplane is not headed directly into the prevailing wind. And so, with several runways closed, many flights can get delayed. So, should you be afraid of turbulence? Generally, no. But if you ever find yourself in an aircraft trying to land in big storm you do have reason to be quietly concernedbut not excessively worried. Remember that airplanes make hundreds of safe landings and takeoffs every day in bad weather. Commercial pilots are trained to fly in all sorts of weather conditions. Accidents are the exception, not the rule. If unusually bad weather is predicted for your destination, the airline will delay itor divert itfor you. Be grateful. What option do you have as a passenger in an airplane flying through turbulence? Well, even though you cant stop the turbulence, you can stop your fear of it. You can do this by not trying to fight it. Dont try to fight the turbulence. So what does this mean psychologically? Well, lets begin with a physiological explanation. The part of your brain that causes you to panic when you feel the discomfort of turbulence is a primitive part of the brain that understands behavior, not language, and that has been conditioned to equate emotional distress with physical danger. When your body feels the first bumps of turbulence, your brain interprets it as a danger and sends out the signal to pump out fight-or-flight chemicals that cause physiological arousal. Now, at this point you have two options. If you believe that there is a danger, and that you have to do something to fight against it, you only encourage your brain to keep on pumping out more fight-or-flight chemicals. Eventually this process escalates and you fall into a panic. Moreover, you cant stop the panic by telling yourself to stop panicking. As I said before, the part of your brain responsible for the panic doesnt understand language. It only understands behaviorand this brings us to your second option. Your second option, and the only way to stop the panic, is to act in a way that tells your brain that there is no danger. So, to stop the panic, stop fighting. And heres how to do it. Instead of fast, shallow breathing take long, slow, deep breaths. Instead of staring around in a frenzy, close your eyes. Instead of clenching the arms of your seat, loosen your grip. Relax all your muscles and just calmly sink down into your seat. This behavior will tell your brain that you are not in danger, and subsequently your brain will shut down the fight-or-flight chemicalsand you will experience a calm relief. Furthermore, the next time you experience the first bumps of turbulence, remember what you have read here and tell yourself, Its OK. This is distress more than danger. Take your hands and feet off the controls and let the plane fly itself. Take slow, deep breaths. Close your eyes. Relax your muscles. And then any of the first sputters of fight-or-flight response will just dissipate. One final reminder. Wise pilots in small aircraft always keep their seat belts and shoulder harnesses fastened at all times because turbulence can happen at any time. So, as a passenger, consider it wise to keep your seat belt gently fastened whenever you are in your seat. When someone experiences a particularly strong fear of turbulence, the fear may be more symbolic than real. That is, the bumps and jolts of an airplane can cause a fear way out of proportion to the actual situation because the aircraft turbulence unconsciously reminds the person of the turbulent emotions of his or her psychological conflicts that have resulted from childhood emotional wounds. Your website did NOT help me. Are you kidding? Talking about how turbulence can cause the plane to crash? If someone is scared of turbulence, they are even more scared now. And for someone that catastrophisizes, the possibility that a storm can cause THREE real dangers of the plane crashing? Not ok. Thank you, sincerely, for causing me to be even more afraid than I was two minutes ago of flying for 16 hours on Saturday. Really, thanks. Notice that the key element of this comment is the womans anger that I caused her to be more afraid than she was before. This is a perfect example of the self-sabotaging feeling of victimization. Thus we can see that there is a certain satisfaction in her being even more afraid than I was two minutes ago; that is, her pain is intended to hurt me. The worse she feels, the more she can blame me. She carries this dynamic even further when she concludes, with sarcasm, Really, thanks. Yes, the worse she feels, the more she can blame me; the more she can blame me, the more satisfaction she gets; and the more satisfaction she gets, the more she can thank me. Consequently, the truth of her anxiety reveals itself: the dysfunction that she throws at me in satisfaction comes back to hit her as a disability. Now, the psychological importance of this is not located just in her saying this to me. The importance resides in a fact that I see daily in psychotherapy clients; that is, just like many clients, she most likely has been using her disability to blame her parents all her life. She wants her parents to love her, and yet she feels so emotionally wounded by her parents lack of concern for her that she uses her unconsciously self-made disability as a weapon of anger to throw back in her parents faces as an accusation of their failures. All in all, this case illustrates something fundamental about human psychology. All the disorders of life, not just a fear of flying, have their final cause in childhood emotional wounds, and, if these wounds are not brought out into the light of conscious awareness, they will produce an unconscious anger that can sabotage you no matter where you areon the ground or in the air. If, however, these wounds are brought out into the light of healing and understanding, then any fear can be overcome. The following questions from readers address very specific issues that may nevertheless be of interest to others. My fear is flying in and out of Gibraltar where on certain occasions the pilot has to make what seems like a sharp fast pull up on landing and has to fly round again, try again and if not successful fly to Malaga airport instead; this is very specific information and obviously doesnt apply to most of what you explain which still leaves me terrified of flying. If you could explain how safe this process is it would be of huge relief and help to me. Generally most of what you say calms me a LOT! Most aircraft passengers take landings for granted; that is, they assume that the final descent will automatically conclude with a smooth landing. And thousands of times a day smooth landings happen all over the world. But pilots are trainedright from their beginning instruction in a tiny two-seat training airplanenot to take anything for granted. Before taking off, pilots must review emergency procedures for things that could go wrong during the takeoff. When starting the final descent, pilots must review all sorts of procedures for navigation to the airport and for configuring aircraft systems for landing. And, on final approach to landing, every pilot must be highly alert and prepared to abort the landing and fly around for another try if anything does not appear normal. A landing can be rejected for any reason. There could be a flock of birds in the area, there could be animals on the runway, the winds could be too gusty, another aircraft could have inadvertently taxied onto the runway, the alignment with the runway may not be correct when breaking out of low clouds, or maybe the pilot sees that the winds have changed and the aircraft is in danger of landing too far down the runway. When a landing is rejected, its called a missed approach. The pilot will immediately declare a missed approach to the air traffic controller, and then the pilot will fly at a predetermined heading and altitude as specified on the navigation chart. (The pilot will know exactly what heading and altitude to fly because the pilot and co-pilot reviewed the navigation chart in preparation for the descent.) Then the controller will direct the pilot back around for another approach to try again. Given that the conditions which caused the missed approach in the first place have changed, the pilot can land the airplane without incident. If the second attempt fails, and the plane ultimately lands at another airport, this means that the visibility was so bad at the intended airport that the pilot decided it was better to land at another airport than to risk getting killed at the intended airport. In my opinion, thats a good decision. Today I flew in a commercial jet that suddenly dropped in altitude in two successionsthe pilot came on after, apologized for making the maneuver and said he was averting another aircraft. Why so severe a drop, and were we in danger? During all phases of a flight, air traffic control is primarily responsible for aircraft separation. Nevertheless, pilots must always be vigilant and must take final responsibility for avoiding other aircraft. During cruise flight, air traffic controllers usually keep aircraft several miles apart, and pilots can therefore relax their vigilance. However, in close proximity to an airportthat is, during departures and arrivalsmaintaining separation of aircraft in flight becomes a complicated task. At these times, and when visibility allows, pilots must keep a visual lookout for other aircraft, in addition to relying on instructions from air traffic control. In this tense environment, mistakes can sometimes happen, and two airplanes can get too close for safety. If the controller catches the mistake before the pilot of either airplane, then the controller will issue a command to one of the pilots to take immediate action. Now, pilots are trained so that when they hear a controller use the word immediate they dont stop to think. They do whatever the controller says, without hesitation. In either case, to a passenger an immediate maneuver can feel like a sudden and dramatic actionbecause it is. Immediate action usually involves making a descent or a turn. Why? Well, these maneuvers take very little time. It can take a relatively long time for a big airplane to climb even several hundred feet, but the plane can drop several hundred feet in just a couple seconds. Similarly, turns can happen quite quickly. Therefore, when two aircraft are in a situation that requires immediate evasive action, most likely one airplane will descend quickly and the other airplane will turn quickly. When I was taking my flight training, we would often see buzzards gliding in thermals. My flight instructor told me that, if a bird ever got too close to an airplane, the birds immediate reaction would be to fold its wings and dive. Therefore, my reaction in such a case should be to turn, not dive, and let the bird look after itself. Sure enough, one day as I was making an approach for my landing, I noticed a buzzard a few yards in front of me. I hadnt seen it previously. Apparently, it hadnt seen me either. But I was close enough to see it look up suddenly, its eyes wide open in surprise. I could only imagine what it was thinking in the moment. (I wont repeat it here because I was silently saying the same thing.) Then the big bird dropped like a rock into a dive while I swerved to the right and took a sigh of relief. Because aircraft operations during departures and arrivals have the greatest likelihood of unexpected immediate maneuvers, regulations require that, during the takeoff and landing phases of flight, baggage must be stowed, food service must be suspended, and passengers must be seated with seat belts snugly fastened. So, if you have ever complained about the strictness of these rules, now you have reason to be thankful instead. 1. To be technically accurate, lift depends on the differential between the velocity of the air flowing over the top of the wing and that flowing under the wing. But for our psychological purposes here it can simply be said that, however lift is generated, its as if the wings pushed the air down. AGC  Quarterly Enforcement Report provides information from the Federal Aviation Administration (FAA) about which airlines have been fined or disciplined by the FAA in the last few years. Aviation Accident Statistics are compiled by the FAA. NTSB Aviation Accident/Incident Database provides searchable database information from The National Transportation Safety Board (NTSB). Passenger Injuries and Injury Rates, by year, are compiled by the NTSB. Jet Stream current information around the world. Opens to the US, then click on any other country. AirSafe.com provides safety information for the airline passenger. Air Traffic Control System Command Center provides real-time FAA updates about airport delays around the US. British Air-ways Health is a comprehensive source of advice about health matters related to air travel. eHow to Overcome Your Fear of Flying provides links to many helpful tips related to commercial flying. Useful Tips for Airline Travel  from the Aerospace Medical Association (AsMA). PDF format. Virtual Hospital: Psychiatry: Fear of Flying  helpful information from the University of Iowa Hospitals and Clinics. Virtual Naval Hospital: Patients HomePage provides a broad range of medical information for the consumer specifically relating to Wellness issues. Aviation Links of special interest to pilots and the General Aviation community. Fear of Flying explains the various issues related to fear of flying. Fear of Flying Treatment explains the various treatment options for fear of flying. Progressive Muscle Relaxation explains a self-taught relaxation technique. Why pay for something somewhere else when you can get it here for free? Systematic Desensitization explains a simple, self-taught treatment for fear of flying. Why pay for something somewhere else when you can get it here for free?